27. Zika virus: The next pandemic? 35. 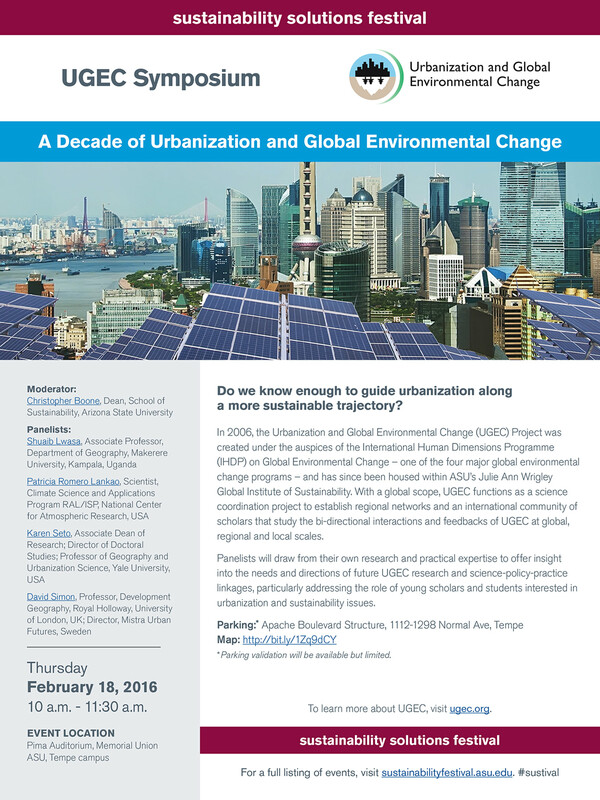 Agricultural Resources Advisor, Foreign Agricultural Service, Washington, D.C.
(Tuesday, February 9, 2016) Shi Han, City University of Hong Kong and School of Sustainability Visiting Professor will present Natural Capital in China from 12:00-1:15 p.m. in room 481, Wrigley Hall, Arizona State University at the Tempe campus. More information and RSVP. (Tuesday, February 9, 2016) When the Vatican reprimands US nuns—citing their “radical feminism”—three fearless women risk their place in the Catholic Church to follow another higher calling: social justice. Join us for Radical Grace with a post-film discussion. Doors open 6:30 p.m.; showtime 7:00 p.m., Harkins Valley Art Theater, 509 S Mill Ave, Tempe. More information and RSVP. (Friday, February 12-Saturday, 27, 2016) The Sustainability Solutions Festival convenes the planet’s top sustainability events and organizations to discover and explore how we can individually and collectively reimagine our lives and our planet. The Festival’s many forums and events include: Conferences, Community gatherings, and Film screenings. For more information. (Friday, February 5, 2016) Tim Marshall, PE, Haag Engineering will present Damage Survey Results from the Joplin E5 Tornado at 12:00 p.m. in room 5536, Coor Hall, Arizona State University at the Tempe campus. More information. (Saturday, February 6, 2016) ASU Night of the Open Door @ West offers events and interactive activities in mathematical and natural sciences, humanities, arts and cultural studies, social and behavioral sciences, along with dozens of hands-on activities that excite curiosity for teachers, kids, lifelong learners and parents. From 4:00-9:00 p.m. on the West campus. More information. (Monday, February 8, 2016) The ASU Commission on the Status of Women is pleased to invite ASU staff, faculty, and students to this special leadership event on women in diversity leadership. A panel of women leaders will explore important topics such as how they became leaders, challenges of leadership, the work of their respective offices, and their vision for diversity and inclusion at ASU. From 8:00-10:00 a.m. in the Turquoise Room, Memorial Union, Arizona State University at the Tempe campus. More information and RSVP. Webcast RSVP. (Monday, February 8, 2016) Niles Lehman, Portland State University will present A Different View of Life’s Origins at 3:00 p.m. in the auditorium (B105), Biodesign Institute, Arizona State University at the Tempe campus. More information. (Tuesday, February 9, 2016) The moving account of Richard and Mildred Loving, who were arrested in 1958 for violating Virginia's ban on interracial marriage. Their struggle culminated in a landmark Supreme Court decision, Loving v. Virginia (1967) which overturned anti-miscegenation laws in the United States. Free and open to the public at 4:30 p.m. in Mohave (236), Memorial Union, Arizona State University at the Tempe campus. More information contact susan.valeri@asu.edu or 480-965-5775. (Thursday, February 11, 2016) Lee Dugatkin, University of Louisville will present Altruism Writ Small: E. coli Cells Protect One Another from Antibiotics from 12:00-1:00 p.m. in the auditorium (B105), Biodesign Institute, Arizona State University at the Tempe campus. More information and RSVP. (Thursday, February 11, 2016) Yong Keun Chang, Advance Biomass R&D Center, KAIST will present Research Activities in the Field of Microalgae-Based Biorefineries at Advanced Biomass R&D Center at 4:00 p.m. in the auditorium (B105), Biodesign Institute, Arizona State University at the Tempe campus. More information. (Tuesday, February 9, 2016) Jessica Alvarez Guevara and Becky Ball, Arizona State University will present Country Mouse and City Mouse: A Story of Herbivores, Urbanization, and Delicious Desert Plants from 12:00-1:30 p.m. at Webster Auditorium, Desert Botanical Garden, 1201 N. Galvin Parkway, Phoenix. Please RSVP to sbeute@dbg.org. Ecologists who are motivated to achieve real impact in nature conservation should consider engaging with the corporate sector, according to an editorial in the February 2016 issue of the journal Frontiers in Ecology and the Environment. Read more. Regents’ Professor is the highest faculty honor and goes to full professors from one of the three Arizona public universities whose exceptional achievements have brought them national or international distinction. With the latest additions, ASU has a total of 83 Regents’ Professors. The seven newest will be recognized at a ceremony Thursday at the Evelyn Smith Music Theater on the Tempe campus. Read more. Three Arizona State University faculty and Center for Biodiversity Outcomes affiliates will be leading events at the September 2016 International Union for Conservation of Nature (IUCN) World Conservation Congress in Hawaii. Their proposals were among those selected from a field of nearly 1,500 submitted for consideration after review by at least three independent technical reviewers. Read more. Ashley Hutchinson knows the orange juice served in Arizona State University dining halls came from fruit hand-picked off Tempe campus trees. The only thing she does not know is whether the juice she drinks came from the same oranges she helped pick. Read more. In our rapidly urbanizing world, more than a billion people living in slums lack access to essential services, such as water and sanitation, and to emergency response — a situation made even more perilous as climate change is expected to drive more frequent extreme-weather events in the coming decades. Read more. Arizona State University researchers are reporting on a 10-year project that studies the long-term effects humans have had on the land — and the consequences for the communities whose livelihoods depend on the land. Their research has led to some surprising reasons why communities survive or fail. Read more. Now that some heavy hitters — multinational conglomerates, the USDA and EPA, influential think tanks and the U.N. — see tackling food waste as a major humanitarian, financial and environmental imperative, the question remains what to do about it. Read more. The World Health Organization has warned that the Zika virus is “spreading explosively” in the Americas, and countries and health organizations are on full alert with emergency meetings taking place to prepare to halt the spread of the Zika virus. ASU's Dr. Qiang Chen tells us what to expect from the latest global health concern. Read more. The world wastes more than $750 billion worth of food every year — 1.6 billion tons of food left in farm fields, sent to landfills or otherwise scattered across the countryside, plus 7 million tons of fishery discards at sea. Read more. Application deadline February 6, 2016. More information.